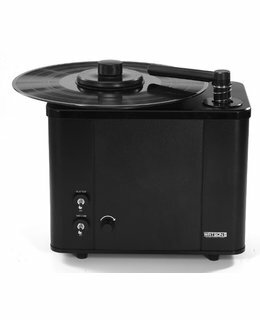 A Record Cleaning Machine does not do all the cleaning automatically for you. It just makes record cleaning easy. The Watson's Record Cleaning Machine is just doing that, making it easy, without making it expensive! You wish you bought it earlier, what a relief this machine is! 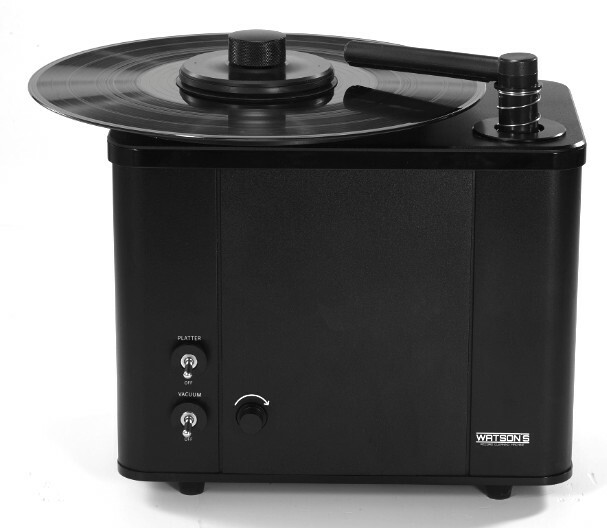 The Watson's Record Cleaning Machine gives you a stable platform to attach your disc to. Now you can easily bring on Record Cleaning Fluid. You can clean by using the supplied brush, the Watson's will not slow down or make your record slip on the platter when you put more pressure on. 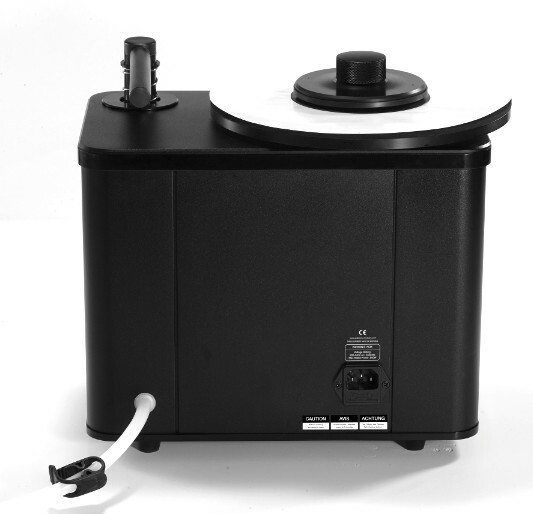 It dries the record by suction, the vacuummotor is strong enough to do it's job in just two rotations. The Watson's record Cleaning Machine is solid built. The full aluminium body forms a strong base for all it's components. The platter is stable and smaller then the record. 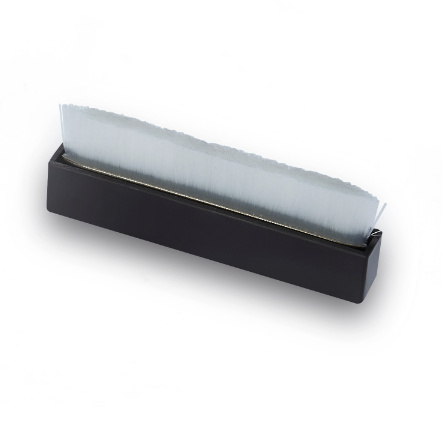 This smaller size keeps the platter dry when you mistakenly apply to much fluid on the disc. 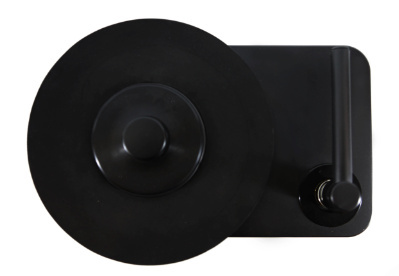 The heavy constructed bearing makes the platter rotate without friction and without play when pressure is applied to. The supplied record clamp attaches to the threaded spindle. It holds the disc firmly in place preventing it from slipping. It also -very important- protects the record label from getting wet. The suction arm supplied with the Watson's is meant for 12 inch vinyl. Additional arms for 7 inch and 10 inch are available. The felt strips on the suction arm prevent rough contact between arm and record. The strips are replaceable. 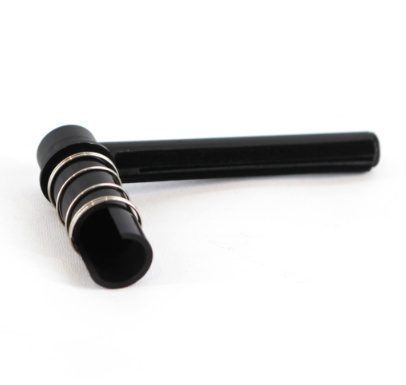 The vacuum strength can be controlled with the vacuum control knob. Using the Watson's is as simple as it can be. First put the record on the platter and screw the clamp on the spindle. Then start rotating the platter by flipping the upper switch. Now bring on the cleaning fluid and spread it evenly over the surface with the brush, without applying pressure. When the fluid covers the disc equally apply pressure with the brush and let the record spin a few rotations. The brush and fluid together will do the cleaning. As soon as you think brushing is sufficient flip the lower switch to turn on vacuum. Within two rotations the vacuum will remove all dirt and contaminations from the record's surface. When dry switch off vacuum first, the suction arm will raise itself. Then switch of the platter rotation. Take your record off and enjoy the sound. A very strong point is - just in case- that we have parts available if something fails. However, we do not expect anything to break down. A Watson's Record Cleaning Machine is meant to last long. It is well designed and well built. The Watson's is available as a 115V-60Hz or 230V-50Hz machine. The type of mains cord can be selected during ordering.